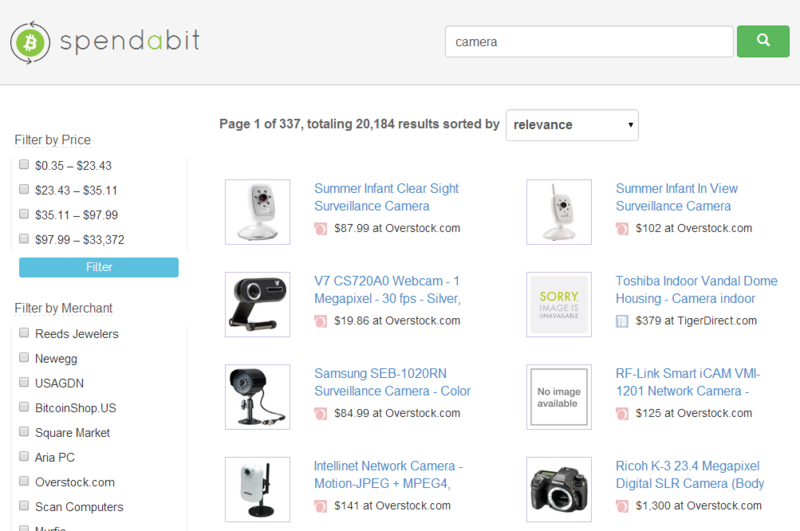 Spendabit announces its launch of a website that lets you find over 1.5 million products being sold in bitcoins from a single search bar. The solution technically goes beyond searching on Google for a product and getting a list of results from various online marketplaces like eBay, Amazon, etc, and then deep-diving into the product details page. Such results are often search engine optimized; others are not and will not be compared on a level playing field. A search for “camera” yields 20,184 results. Merchants include Overstock, TigerDirect, Bitcoin Shop, Bitcoinin, Aria PC, Newegg and others. This is a direction sought by other e-commerce players like Bitcoin Shop, who would likely include products sold for Litecoin and Dogecoin as part of its solution. CoinLlama has already done something similar for those looking to buy bitcoins through an exchange. On reddit, users expressed positive feedback with one claiming he found a better deal than on Amazon. Some though have requested expansion to outside of the US and to allow searches by region. DC Magnates also gave the search a try, as one of our writers used Spendabit to find a Nexus 5. The website yielded the lowest cost from GSM Nation. Taking into consideration the cost of shipping and taxes, the writer found that paying in bitcoins from GSM Nation was about 2% higher than buying it directly from the Google Play store, and in line with prices on Amazon. Merchants not yet listed can send a message to Spendabit for consideration.